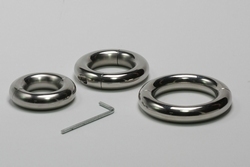 Round Splitable Ball stretcher, 15 mm thick. Standard inner diam. 30, 33, 36, 39 mm, no grove. Key incl. Round splittable ball stretcher height 15 mm, Very comfortable to wear. Closed by just one allen bolt. Allen key is included. It ranges from inner diameter 30 mm till 54 mm in steps of only 3 mm. Can be used as ball stretcher, the bigger ones as a splittable cockring and the biggest as a bracelet. Made from high grade stainless steel. Masters in Steel, for quality.